VALA’s most prestigious award is the Robert D. Williamson Award, established in memory of one of the early pioneers of our industry, Bob Williamson. In keeping with Bob’s legacy, this biennial award honours those who demonstrate leadership, curiosity, excellence and innovation and, in the view of their peers, are outstanding contributors to the development of information technology usage in Australian libraries and information services. The Williamson Award is open to both individuals and organisations in the Library and Information Science profession within Australia. The Award consists of a medallion and cash to the value of AUD $2,000. 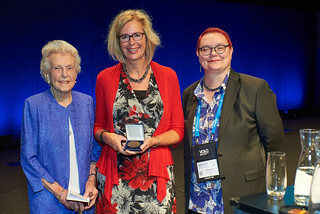 The 2018 Williamson Award was presented to Rose Holley from University of New South Wales, Canberra. The winner was announced and presented after the first plenary session at the VALA2018 Conference on Tuesday 13 February 2018 by Enid Williamson. Click HERE for reflections on the history of the award from Enid Williamson. Click HERE for reflections on the history of the award from Enid Williamson. The VALA web site provides details about some of the Robert D. Williamson Award recipients. Although originally a chemical engineer, as manager of APM’s (now AMCOR’s) research library, Robert (Bob) Williamson was an early devotee of information technology in libraries. By the early 1970’s he had persuaded management to invest significantly in relevant US computer databases and software to support the company’s business objectives. This predated all of the publicly available services. Professionally Bob was a leader. He was a quiet man, both curious and innovative, a generous advisor to colleagues, and an eager participant in the professional debates at the time. Bob also developed “recipe books” to help new online searchers navigate the different commands needed to access the new online services. Bob was the industry representative on the STISEC committee convened by the National Library of Australia to quantify scientific and technical publication in Australia. When Peter Judge of CSIRO formed ALIA’s national Information Science Section, Bob was an obvious choice to convene that Section in Victoria just a few years before his sudden and untimely death in 1980. It is therefore fitting that VALA’s most prestigious award is named after Robert D. Williamson.